The Classic of Mountains and Seas or Shan Hai Jing, formerly romanized as the Shan-hai Ching, is a Chinese classic text and a compilation of mythic geography and myth. Versions of the text have existed since the 4th century BC, but the present form was not reached until the early Han dynasty a few centuries later. It is largely a fabulous geographical and cultural account of pre-Qin China as well as a collection of Chinese mythology. The book is divided into eighteen sections; it describes over 550 mountains and 300 channels. All 18 chapters can be classified into 4 categories: Classic of the Mountains (contents 5 chapters), Classic of the Seas (contents 8 chapters), Classic of the Great Wilderness (contents 4 chapters), and Classic of Regions Within the Seas (contents 1 chapter). It recorded more than 100 diplomatically related realms, 550 mountains and 300 rivers, along with the geographic and cultural information of the nearby realms. The Classic of Mountains and Seas also recorded up to 277 different animals. Scholars believe the records of animals in Classic of the Mountains are somewhat exaggerated due to the long history of people compiling them in different dynasties; yet they still have a certain degree of authority, because they were generally written by sorcerers and Fangshi based on the experiences they gained from their trips. Chinese scholar Ming Hua Zhang claimed that the Zhulong, which was a mythical creature mentioned in Classic of the Great Wilderness: North, is symbolizing the aurora (northern light). 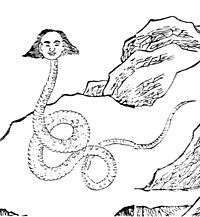 The Zhulong is (according to Classic) "red, with a human face and a snake body that is thousand mile long. It is the god of Zhong Mountain." He believes that this description matches with the characteristics of aurora. Bai Ze - titular figure of the lost treatise on demonology which has similarities to some of the Shanhaijing. Shi Yi Ji (拾遺记) by Wang Jia - a 4th-century work containing "apocryphal" versions of some of the stories in the Classic of Mountains and Seas. ↑ Lewis, Mark Edward (2006). The Flood Myths of Early China. State University of New York. p. 64. ISBN 978-0-7914-6663-6. ↑ Leo Bagrow, R. & A. Skelton (2009). History of cartography. Transaction Publishers. p. 204. ISBN 1-4128-1154-6. 1 2 Lust, John (1996). Chinese popular prints. Brill Publishers. p. 301. ISBN 90-04-10472-0. Birrell, Anne, ed. (1999). The Classic of Mountains and Seas. Translated by Anne Birrell (illustrated ed.). Penguin. ISBN 0140447199. Retrieved 24 April 2014. Davydov, Andrey (July 2013) [Composed 2002]. "Шань Хай Цзин" и "И Цзин" - Карта Психофизиологической Структуры Человека? ["Shan Hai Jing" and "I Ching" - Map of Human Psychophysiological Structure?] (in Russian). ISBN 9781301510009. Fedoruk, V. V.; Davydov, A. N. (1998) [Composed 1997]. Corr. of RAO L. A. Verbitskaya; Assoc. Prof. B. G. Sokolova, eds. Шань Хай Цзин - Своеобразный Каталог Психо-Физической Структуры Человека? [Is Shan Hai Jing The Original Catalog Of Psychophysiological Human Structure?]. First Russian Philosophical Convention. Human Being – Philosophy – Humanism (in Russian). Volume VII. Philosophy and Human Problem. St. Petersburg: SPSU Publishing House. p. 355, p. 488. ISBN 9785288018947. B4231.R6751997. Archived from the original on September 2009. Retrieved 24 September 2014. Mathieu, Remi. 1983. "Etude sur la mythologie et l'ethnologie de la Chine Ancienne." Vol I, "Traduction annotee du Shanhai Jing." Vol. II, "Index du Shanhai jing." Paris: College de France, Institut des hautes etudes Chinoises.